93 pp,, grey cloth boards with a stamped design on the front cover of a hammer and a rock. There are numerous black and white illustrations on every page by M K Scott. The book starts with "Perhaps you don't know one stone from another - very few people do. But perhaps you have collected some stones already, because they were pretty or odd looking. You'd like to know what they are, where they came from, and what they are made of. This book answers your questions." The book continues to describe how to start a rock collection, how to identify rocks, how to go on a 'real collecting' trip, and even how to make shelves for your rock collection. The book's endpapers are diagrams of different stones described in the book. Measures 8 1/2" x 7 1/4"
. Cover have very minor edge wear, with several small stains on the front. The book itself has been bent in a slight upwards curve. Previous owner inscription on front free endpaper. 6 pp. Image of man fueling a furnace on front cover. Discusses the fuel our bodies need, diabetes - its signs and causes, how insulin helps the diabetic and how to guard against diabetes. One of the ways to guard against diabetes is "Infections of teeth, tonsils and other organs should be promptly treated and removed". Hmmm.. Measures 7 3/4" x 5 3/8".. 36 pp, paper wrappers with black and white illustrations. The pages are numbered 129-160. Three magazines were combined, so that "all the attractions of each magazine will now be concentrated in one." The new magazine was instructive and moral, and featured a large number of woodcuts. A great variety of material was included such as bible stories, little moralized tales, fables, dialogues, poems, letters, puzzles, and games. There were often featured articles that would deal with geography, travel, natural history and with various industries and arts. A highlight of this particular volume is an excerpt detailing what attractions were found at Merry's Museum, such as a aquarium filled with fish, and the story of Cleopatra. Measures 9" x 5 3/4"
Advertising Leaflet for Glyco-Thymoline – An Alkaline Antiseptic for the Efficient Treatment of Inflammatory Conditions of Mucous Membranes. c1910. Quackery? A flyer for Glyco-Thymoline, an alkaline antiseptic for the efficient treatment of inflammatory conditions of mucous membrane in all parts of the body, by Kress & Wren Company. 36 pp Ninth Annual Report, of the Managers of the New York Institution for the Blind, to the Legislature of the State, Made in Conformity to Law. January, 1845. 8 3/4" x 5 1/2" wear on cover, foxing throughout, one page has torn edge but does not effect text, possible water damage on lower right side, inscribed 186 pp. Leather with applied marble cover, stamped Franklin Institute on inside cover, mostly text with illustrations and plates. Advertising Blotter - Phillip's Indian Herb Cough Cure - Image from photographs of Bulldog and Toddler with a Rifle. ..
A 3 3/8" x 6 1/2" advertising blotter printed in black and white with two images from photographs. The first is a bulldog sitting at attention. Captioned "I am Barking For Phillips' Indian Herb Cough Cure. Nature's Best Remedy for Coughs, Colds and La Grippe. manufactured only by A. J. Phillips, Norwood, NY USA. The seond image is a toddler holding a rifle and wearing a bullet belt. It is captioned "Shoot that cough with Papa's Indian Herb Cough Cure. It will do thee good." The reverse is blank. Light to moderate wear.. 32 (unnumbered) pp including standard almanac information and information on numerous diseases and maladies with presumed cures by using the anit-bilious compound. Some of the conditions addressed include Digestion, Dyspepsia, Loss of Appetite, Chronic Diarrhoea, The Liver, etc. Additional testimonials on the back inside cover. Measures. New EnglandBotanic Medical & Surgical Journal. Semi-Monthly. Calvin Newton, M.D., Editor and Proprietor. Vol. III. No. 9. Worcester. Printed by Henry J. Howland. 1849. 457 pp. Green blind embossed gilt cover, frontispiece, illustrated with approximately 500 engravings, 15 plates, 23 pages at the end contain advertising. "Glare is the gangster of light," this brochure claims in its opening salvo. It continues on to declare "It beats upon your brain with the bludgeon of brilliance. It strips you of stamina, rifles you reserve and plucks your power, and makes off with you energy." Serving as an advertisement for Curtis Lighting, this brochure features their product 'X-Ray Reflectors', which is an indirect lighting element that cuts down on the glare you would get from direct lighting. The small brochure continues on to say that it helps with optiphosis, which according to 'lighting engineers' and optical science is any illness that can be caused by a harsh glare, such as headaches, loss of productivity, and nausea. The brochure itself is printed in black with green accents used in the designs or illustrations. The front cover has a wonderful art deco influenced illustration of eyes with light beams hitting their pupils. Single fold brochure. 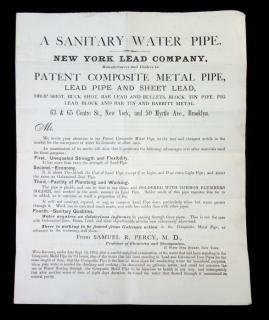 Measures 7" x 3 1/2" (folded), 7" x 7" (unfolded) Single-fold circular promoting the advantages of composite metal pipes over lead or galvanized iron pipe. Bottom of the first page references a test conducted by a professor of Chemistry and Therapeutics. He examined water that stood for 24hrs in a Composite pipe, a Lead pipe, and a Galvanized iron pipe. He found that the Composite, unlike the other two, showed no signs of galvanic action, and showed no potential health risks. On the next page, a practical and analytic chemist reaffirmed that the Composite pipe was less harmful than the alternatives. Following that is a descriptive narrative of their products as well as pricing. Measures 10" x 8".. Songs, Jokes, Definitons of Dreams, Language of Flowers, Etc. Etc,. Grafton Medicine Co..St. Louis Mo..
A 32 pp booklet providing information how to catch and tame birds, bird food, cages, breeding, extensive information on diseases and remedies followed by general remarks, the canary, breeding, singing, molting and varieties. The remainder of the book focuses on Palmer's products including perfumes, soaps, lotions and other remedies. Illustrated covers. Measures 4 3/4" x 3 1/4". . A 32 pp booklet printed by the maker of Dr. Henry's World's Tonic and Blood Purifer and Dr Henry's Root and Plant Pills. Available for two three-cent postage stamps. An array of popular interests of the day including wood-cut engravings with children's verses, songs with music and verse, Language of Flowers, Marriage Guidance, Facts about the Bible, Language of the Handkerchief, Definition of Dreams and of course many testimonials for the products. Back cover is a wood cut of a stylized bird with a talk bubble that reads "Quack" creating a potent while chanting a verse about quackery and why you should use Dr. Henry's instead. Measures 4 3/4" x 3 1/4"..
An 8 pp booklet with full color covers and in-text illustrations throughout. The purpose of the booklet is to education predominantly homeowners on reading and understanding the weather and more importantly how Lowe Brothers has created paints to withstand any weather conditions. It also includes lists of prognostications such as "If larks fly high and sing long, expect fine weather" and "In winter, when the sound of the breakers on the shore is unusually distinct, frost is indicated". Additionally it includes tips regarding selection and use of house paint finally - How to Foretell Results when Painting, which concludes that Lowe's High Standard Paint will give the best results. . 115 pp. Applied illustrated cover over blue cloth, frontispiece, illustrations, plates. 54 pages, Green cloth over board. This item is two books in one: Preston's Complete Time Table, and Preston's Tables of Interest. There were bound together by the publisher. The first is a perpetual calendar which allows the reader to figure out the "number of days from any dat in any given month to any date in any other given month. The second book allows the reader to figure out the "interest on any sum from one dollar to five hundred dollars" when that interest is computed at 6 percent. Measures 10 1/2" x 8". 111 pp journal on nursing. The 'Trained Nurse and Hospital Review' was the pioneer nursing publication in American and it ran from 1893 to 1950. This item is the September 1926 issue. The front cover features a photograph of Stella Boothe Vail (a prominent nurse of the times and a specialist in children's health and hygiene) done by H. W. Simmons. Some of the articles in this issue are: "The Nurse's Part in Prenatal Care", "Helps in Pediatric Nursing", "Nutrition Forum: Food to Tempt Children's Appetites", and "A Guiding Code of Ethics in Nursing Relationships." Item includes a newspaper article on Stella Booth from the NY Sun Globe, March 1924. Measures 10" x 6 3/4" (journal), 9 3/4" x 7" (newspaper article) . Minor cover wear. Pages are toned due to age. The article has red pencil on the bottom detailing the name and date of the newspaper. 8pp. Illustrated wraps with crossed United States and Mexican flags. Held in place with red, white and blue tasseled string tie. The event was given by Thomas J. Watson at the Union Club. Includes a full page image from a photograph of the honoree. 4 pp of his biography, focusing on a multitude of honors. 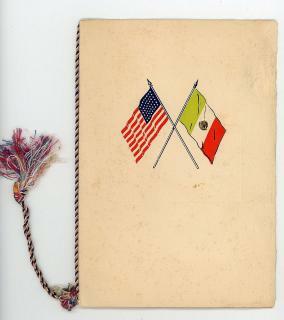 The following page is a list of Mexican aviators, graduates of the United States Naval Advance Training Course. The final page is the menu. - a simple three course meal. . Francisco Castillo Nájera (25 November 1886 in Durango, Dgo. – 20 December 1954 in Mexico City) was a Mexican diplomat and politician. He was president of the Assembly of League of Nations from 1934 to 1935, ambassador to China and the United States, also as the Dean of the Diplomatic Corps in the last year of his tenure, 1945, and Secretary of Foreign Affairs from 1945 to 1946. 24 pp prospectus and promotional brochure encouraging individuals to become sales agent for the Egyptian Drug Company selling Egyptian Regulator Tea. A buy low, sell high scheme including illustrations and text promoting the teas effect on indigestion, pimple, boils, old sores, ulcers, dyspepsia, corpulency, sick headache, rheumatism, nervous debility, neuralgia and premature old age. Additionally includes numerous testimonials. The back cover depicts a scene on the plantations of the Egyptian Drug company, at Karnak, Upper Egypt. Additionally, includes an order form and a single fold pamphlet titled "The Secret of Beauty" with before and after illustrations to be disseminated with the product. With original envelope. Brochures measure8 1/2" x 6". .
Popular. Edition. Lesson 1. 26 pp. Stiff wrap with image from photograph of Lust. The treatment includes a show with a special shower head at 8 to 14 feet with special attention to the stomach and intestine, followed by a bath, an "internal bath", the consumption of "Inner-Clean" taken daily, following Ehret's Mucusless Diet and much more. This is follwed by pages of diagrams illustrating the tehnic(sp) of the Blood-Washing Method. This is only part one. Part II begins on page 13. The inside covers promote "Yungborn", in Butler NJ - The Original Nature Cure Resort and Recreation Home, Dr. Lust's Health Resort, Tangerine FLA and a promotion for Lust "A Dignified Profession -- Doctor of Naturopathy. The last pages of the book promote such things as Cure by Water - The Kneipp Method, The Nature Method of Healing by F. E. Bliz, and much more. Measures 9 1/2" x 6 1/2". Fading on cover.. Dr. Benedict Lust. President of the American Naturopathic Association, Dean American School of Naturopathy and Editor of "Naturopath" Magazine. Two (2) sets of manuscript student exercises created by a Frist Year MIT student. The first is titles Problems in Descriptive Geometry drawn by W. A. Prentiss with five (5) plates and 50 problems. Measures 9 1/2" x 13 1/2". The second is 12 of 13 plates (No. 7 lacking) with an array of drawings including Rivets drawn full size, Angle and T iron, Eccentric, drawings from models and Problems from Projections. Measures 13 1/2" x 20". .
Manuscript Cures for Hydrophobia & Cancer. ..
A 10" x 6" page that appears to have been removed from a ledger or journal with two entries that appear to be in different hands. The first is a cure for hydrophobia that entails mixing elecampane root, a puff of madder and a quart of new milk brought to boil in a water bath. This mixture is taken multiple times for several days. Complete set of Dr. Jaynes Egyptian Fortune Telling Cards. .. Measures 3 1/4" x 2 3/4". . Moderate to heavy cover wear, particularly on the back strip. The interior pages show moderated toning and some foxing due to age. The first two interior blank pages have inscriptions by previous owners, both in pen and pencil. An oblong 2 3/4" x 4 1/2" celluloid device with two (2) side by side wheels, with a eight (8) window openings on each side. One side is designed to find dominant and sub-dominant chords by setting both wheels to key. It includes Seventh Chords and Major Chords. The reverse is for all instruments including pianos and violins tuned in C. One wheel represents Ninth Chords, the other Minor Chords. Originally had a booklet explaining chord progression and instructions for transposing and outlines chord structure.. Invented by Samuel "Skip" Rapoport, the Lightning Arranger, was a device for arranging orchestrations and transposing music. Rapoport said his device arranges music mathematically, the way music is arranged. It works by turning a wheel on the device, which in turn reveals the appropriate information on another part of the cardboard unit. It sells for $6 and was manufactured for him by a New Jersey company. The arranger comes with a booklet that explains chord progression, provides instructions for transposing and outlines chord structure. It claims to be a simplified method for arranging orchestrations. Literature on the device claims it's good for musicians, arrangers of music, band and choir directors, orchestra leaders, music instructors, supervisors, students of music, singers, accompanists, music teachers, beginners and composers. 53 pp. wraps. Narrative text with full page and in-text illustrations and graphs throughout. The globe is the Telechron Motored Electric Uniclok. It provided accurate time throughout the world with the aid of an electric lamp socket. Primary content Uniclok Globe Directions, The Earth (numerous sections), Demonstrating with Uniclok Time Dial & Globe, The Moon, The Sun, The Zodiac and Zodiacal Constellations, Questions and Answers, Different Models and Information. Measures 7 1/2" x 5". . An 18 pp pamphlet with paper wraps. An address to the Gentleman of the Graduating Class, November 4, 1869. 8 1/2" x 5" Some missing pages at front, inscribed and has hand written notes, foxing throughout, wear on cover Enclosed in between the board, hard covers is a chart that folds out to reveal various diseases that horses, cattle, and sheep could be experiencing. Across the top of the chart are the categories for disease, cause, symptoms and cure, the latter two broken up into horse, cattle, and sheep. The diseases are broken up by anatomy, and include skin laceration, colic, distemper, and many more. Closed measures 6 1/2" x 4 1/4" Chart opened measures 26 1/4" x 17 3/4". George H. Dadd is often considered one of the founders of veterinary medication as it is presently known. Letters mailed and an array of loose materials including the layout of the Pottstown Airport, a revoked Civil Patrol airman's card, an insignia circular, menus and invitations for local events and fly-ins and much more. For a comprehensive description click HERE. In November of 1953, the Pottstown chapter of the Aircraft Owners and Pilots Association (AOPA) - a social club for men interested in planes and aviation - elected Fred K Reigner as their new Chairman. The Chairman had a lot of responsibilities, especially in the Pottstown AOPA – JB “Doc” Hartranft, the President of the AOPA in 1953, was quoted in a local Pennsylvania newspaper complimenting the chapter, saying “you folks really do what you plan.” As Chairman, Frank K Reigner planned dozens of outings around Pennsylvania and beyond, sending letters almost daily to coordinate their meetings and social events. 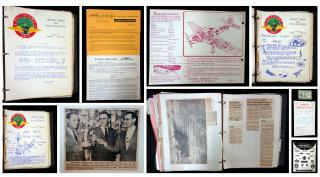 In one binder, he kept his notes and copies of all his correspondence for the year he was Chairman, leaving behind an incredible snapshot of the world of the AOPA in the 1950s. A two-sided 9 1/2" x 6 1/2" illustrated advertising circular for the Eye and Ear Infirmary, 527 Walnut Street, Opposite the St. James Hotel, Kansas City, MO. Woodcut depicts physician examining patients eye with the use of a lens. Captioned "By this means of examination, the vessels of the interior of the eye, or any disease, or change is distinctly seen. Enabling the skilled Surgeon to discover and cure diseases that were formerly considered incurable. Promotes Dr. W. H. Kimberlin and the treatment of catarrh. The reverse promotes Dr. E. Y. Munsell, Specialist and Surgeon and his work with spinal curvature and diseases of women. Concludes with a schedules of the doctors monthly to yearly visits to surrounding areas. Measures 9 1/2" z 6 1/2". Edge weara. . A complete adjustable pattern system in original envelope with 32 pp instruction booklet. The system is mathematically founded upon actual measurements and adjust perfectly to the contour of the individual, so the pattern cuts to measure..." The French Tailor System has 6 pieces, adjustable to "perfectly fit the individual". A system of heavy stock pattern pieces which adjust in various ways using grommeted slides. Includes pieces for a jacket and a dart rule square. Envelope measures 23" x 11". All pieces can be reduced to fit the envelope but extend both vertically and horizontally by several inches. The booklet provides extensive instructions and illustrations. Booklet measures 9 1/4" x 6"..
A 3 3/4" x 2 5/8" card with a ring on a string the is to be repositioned across a line of months. The card is to be positions so the A flap faces the sun to create a shadow line. If properly aligned the string will point to the correct time of day. Unfortunately the device can only be used with sun light. Reverse is blank except for patent information. Also includes two fold instruction sheet and original slip case with applied label reading "European Pocket Time-keeper". . Content includes manufactures' handling of dealership requirements, commissions, handling of consumer matters; both sales and complaints. Companies represented include:The Enger Motor Car Co., The Selden Car, Marion Motor Cars, Lewis Cars, Regal Motor Cars,Ford Motor Cars, Oakland King Regal, Pierce Arrow, Skinner Motor Cars (Packard, Chalmers, Dodge), General Electric (Maxwell-Briscoe car) and Sutdebaker. Related merchants include: Kenwell & Brown - Garage and Repair Shop and Exide Battery Depots. In the summer of 1930 several stimulation tests were carried out in Glens Falls, NY on clay loam soil of good fertility in order to identify if adding mulch produced better crops. A variety of crops were used during this test, such as melons, peppers, onions, potatoes, and string beans. In general the findings were inconclusive, with there being little to no discernible effect on crop output with the except of when the soil was of lower fertility and had less natural moisture retention, where the mulch did help. This item includes the 24 page typed report, 40 black and white photographs of the crops throughout the experiment, and 17 cyanotype scientific graphs. There is a list of the titles of the photographs which has the photograph count at 46, however the binder only contains 40. Extensive information and source materials. Black leather covers. Measures 10 3/4" x9". Pages are curled at edge. The report is on printed on tracing paper which is toned due to age, and has minor edge wear. 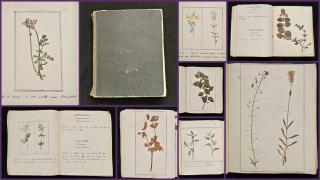 A charming herbarium journal that can be read in two different directions. If you open the book one way, the reader finds a herbarium with 59 pressed specimens, mainly flowers, taped to the pages. When the reader flips the book and reads it in the opposite direction, instead of specimens, there are watercolors illustrating each entry. There are 43 entries in this section, however only 33 pages of watercolors, because in 10 instances the artist doubled- up on a single page. With each specimen/illustration the author lists the plants common name, scientific name, family genus, a brief description and where and when (month only) the author found the plant. The owner of the journal most likely lived in England, as several of the descriptions of the locations the flowers were found mention the River Exe which is near Devon, England on the Bristol Channel Coast. The water colors were done first on a sketch paper which was then pasted into the journal. Similarly the specimens were pressed and dried and then secured by several small pieces of tape on a separate sheet of paper before being pasted into the journal. Of the 59 specimens, 3 have been inserted loose into the blank pages between the two sides of the journal with no identifying information. Additionally, there is 1 specimen pasted in with no description and 2 descriptions of flowers with no corresponding specimen (the latter of which was not included in the count). Some of the flora illustrated are: Primrose, Speedwell, Lady's Smock, and Hedge Wound Wort. Some of the specimens included are: Water Forget Me Not, Penny Royal, Long Stalked Crane's Bill, and Scarlet Pimpernel. Black covers, 137 leaves. Measures 7 3/4 x 6 1/2. An 8 x 11 sheet with engraved patriotic imagery designed to be cut and assembled to create a perpetual calendar. Two (2) tabs to be cut and inserted to provide the days of the week and the months and the days in a month. Excellent. Corner clip on sheet margin..
. Includes a five (5) page report, Opinions of Richard Strode, John Marshall, John Hickman on the subject of the Direct Railroad, March 19, 1852. Manuscript documents include an opinion by Richard Storde indicating the railway will be finished within two (2) years and pay a two percent per annum to the stock holders and a counter opinion by J. Marshall indicating it will not be finished in two years and that it should not pay one percent per annum. A paper confirming the establishment of the Telegraphic connection, a notice of a meeting and a roll-call and the acknowledgment of the second installation to subscription of stock in the West Chester and Philadelphia RailRoad Company. .
A collection of post cards introduced in five series of thirty created by renown artists of the day. Of the 150 cards this offering includes 119 original unused post cards and 31 photocopies of the original cards (place holders). The images were created by the artist, usually designed after one of their original works but making the Vin Mariani the featured element. Many of the cards are captioned with reference to the product. Other artists created completely new concepts to promote the tonic. Each card measures 5 1/2" x 3 1/2". As an example, the artists in the first series Paul Avril, F. Roybet, Ch, Waltner, Lévy-Dhurmer, G, Meunier, Paul Renouard, H, Berteaux, Muenier, Mucha, Hermann Paul, Eug, Murer, Lacault, Ribéra, K, Adler, Léon Glaize, Le Sidaner, Paul-Albert Laurens, Louis Noël, Ferigoule, A, Lalauze, Hagborg, Atalaya, W, Bouguereau, A, Maignan, J, Cheret, De Richemont, Bigot, Sem, Léandre and L, Vallet.
. At age 25, in 1863, Angelo Mariani marketed a patent medicine called Vin Tonique Mariani a la Coca de Perou. Based on Bordeaux wind infused with three varietals of coca leaves in the bottle. It was immediately applauded as an ideal stomach stimulant, analgesic on the air passages and vocal chords, appetite suppressant, antidepressant and treatment against anemia. Dosed as a small glass to be taken 3 times a day, 30 minutes before meals. Each ounce contained 6 mg of cocaine. Loved by kings and queens, popes and presidents, scientists and inventors, writers and dancers and more. Testimonials filled 15 leather -bound published volumes.